The Duchess wore a festive Emilia Wickstead skirt and Brora cardigan for today’s Christmas party at The Orangery. The party was for families & children of deployed personnel from RAF Coningsby and RAF Marham serving in Cyprus. RAF Marham is home to the Tornado Squadron. Oddly, there was ‘snow’ in very isolated parts of Kensington Gardens near the Orangery. You can see it as Father Christmas arrived. A video from Rebecca English. 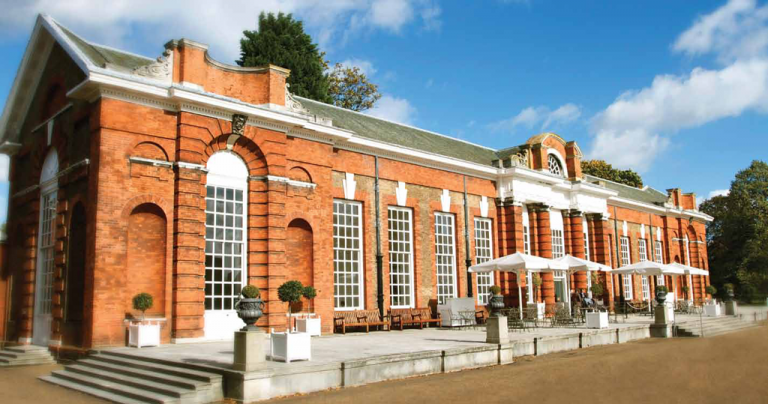 The Orangery is located in Kensington Gardens. The name hearkens back to an era when prosperous homes had a room dedicated to housing fragile plants during the winter, keeping things like orange and other fruit trees safe from the harsh elements. There is a restaurant and the facility can be rented for private events. The party was done in tandem with the Royal British Legion. More about the event from Simon Perry’s People story. 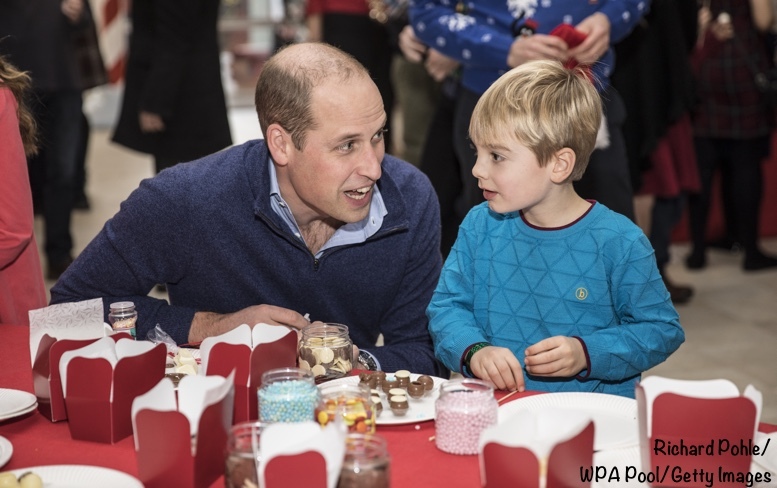 At the palace party, kids enjoyed an fun mix of activities, including a photo booth, Christmas stocking, snow globe decorating, cracker making and entertainment from U.K. party planners Sharky and George. 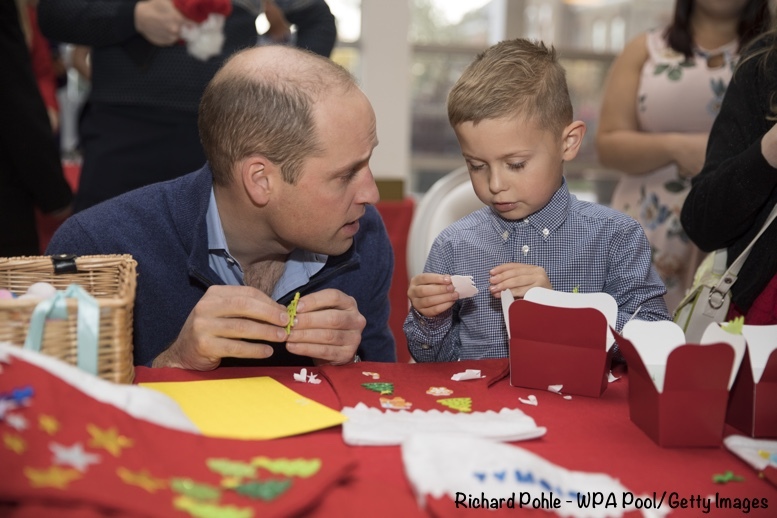 Prince William, 36, even got in the holiday spirit by joining children in making crackers. Here you see Kate with Harry O’Grady, who is five. And the Duke chatting with Harry. Both Kate and William were very much in their element. A video with Prince William from Richard Palmer. And the Duke with 5-year-old Ivan Mother. 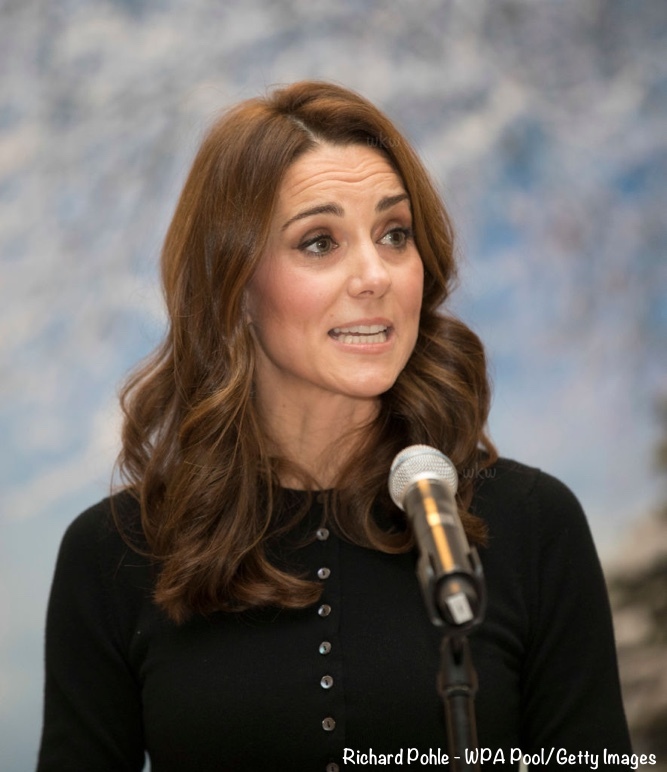 Kate delivered remarks at the party. As someone whose husband has served, I know how hard it feels when a loved one leaves home to do the job they’ve trained for,” she said. A video of the Duchess speaking from The Telegraph’s Hannah Furness. There was even a “snowball fight” with faux-snow. A quick video from Victoria Murphy as the Duke and Duchess depart. Now for our look at what Kate wore. Her skirt is from Emilia Wickstead’s AW ’18 collection. The designer says the 1970’s film Love Story inspired the collection, especially the plaid skirts worn by Jenny, Ali McGraw’s character. (A photo from the film is here.) 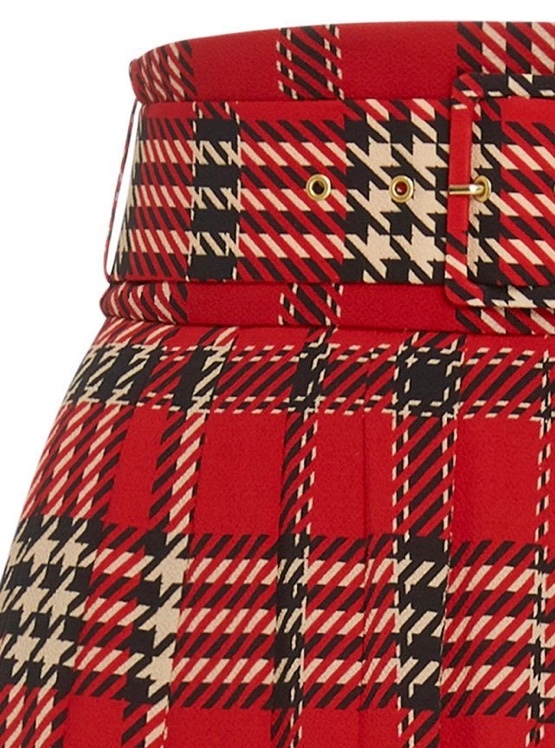 The skirt was available at Farfetch earlier in the season. It is made of polyester with a touch of elastane. Here is a closer look at the fabric. There were several pieces in the collection featuring this pattern. Some are still available, including a dress with sheer sleeves ($1381) and a sleeveless dress ($630). Kate’s cardigan is by Scottish brand Brora, renowned for their cashmere pieces. It is the Cropped Cardigan style($375). The style is fitted, with ribbed trim at the collar and cuffs, with wide ribbing at the waist. Thank you to Christin for pointing out the cardigan. We continue to look for the new boots Kate was wearing. 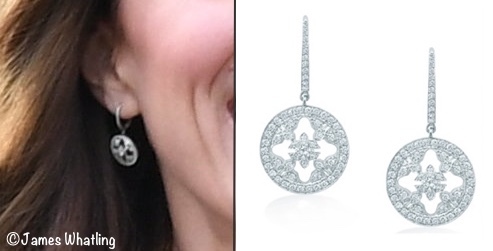 We saw the ‘Empress’ earrings by Mappin and Webb again. A reminder that we hope to see photos tonight from guests arriving at the Queen’s annual diplomatic reception. 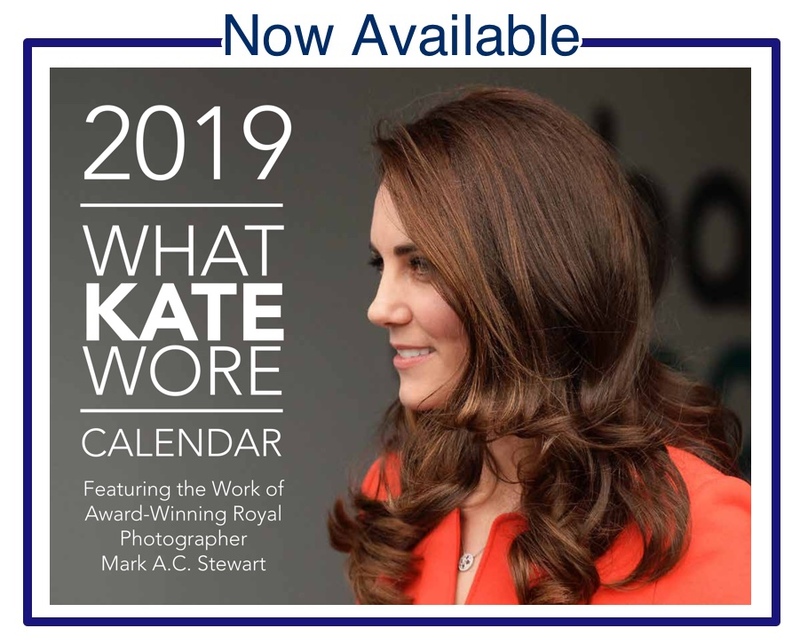 Also today, a topic near and dear to our hearts: the 2019 What Kate Wore calendar, created in partnership with royal photographer Mark Stewart (you may know him as Regal Eyes on Twitter). 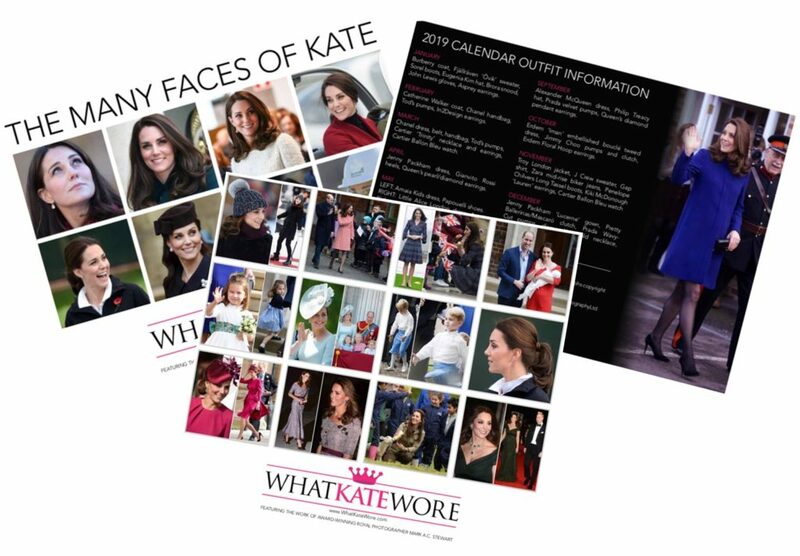 As always, we include our ‘Many Faces of Kate’ page along with all the info on what Kate wore. Mark Stewart’s talent really shines, as it does every year. But it’s especially evident in Mark’s exclusive photos of Prince George, as well as his images of Princess Charlotte. You can just see them in the twelve months view shown above. The calendar measures roughly 11″ by 16″ when open and hanging on your wall. It is available in limited quantities here. Nice casual look overall, but a red sweater or striped shirt with same colors as skirt would have been more young and fashionable looking. I do like the silhouette of the outfit and you can’t go wrong with a tartan skirt at Christmastime. My mother and I had tea and the Orangery when we visited London six years ago, so I was especially excited about this engagement. Such a lovely event and Kate and William looked totally in their element. I loved today’s look. I’m already a huge fan of plaid, but especially for a festive Christmas outfit. The only thing I would have changed is instead of the button down cardigan, I think a sleek black turtleneck would have looked a bit more chic. Something about the cardigan is just not doing it for me. But I love the long skirt with boots. All in all Kate looks gorgeous and glowy as usual. As a fellow long waist-ed woman, I heartily approve of this whole look. When you have a high waist-ed skirt with detailing at the waist band, it can read frumpy so quickly if you add the bulk of a longer sweater or even tuck in a sweater or blouse. This is the look I used to love to wear back when I had a trimmer figure – now my mommy tummy ruins the look for me. Love the festive red plaid and boots with a more practical heal height. A solid YES in my book. I’ve had high tea at the Orangery, it’s lovely, would recommend. What a fun, festive outfit and what a perfect occasion to wear it! 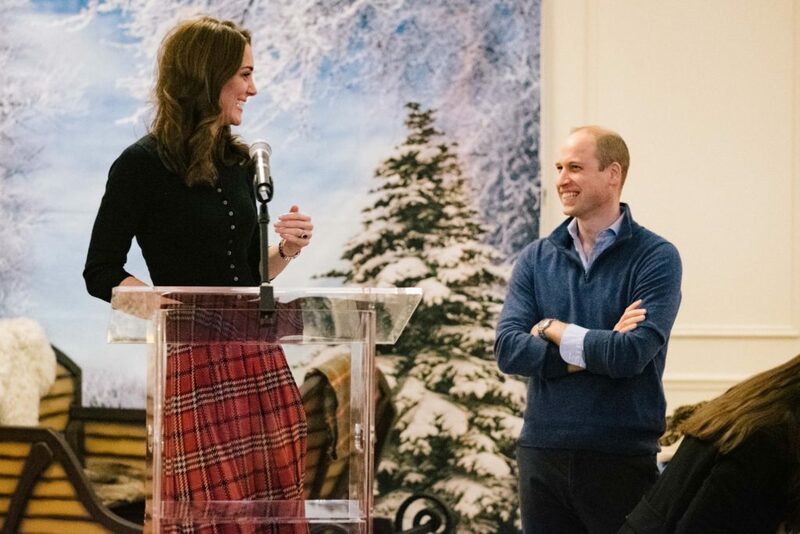 I have to admit I never would have expected Kate to wear such a long skirt in that pattern, it almost feels “loud” for her tastes as she typically defaults to dresses. I don’t follow the “proportions are off” comments. They are not. Had she worn longer sleeves Kate would have looked so matronly (a look she tends to favor) and covered up. I think the effect would have been rather suffocating. Love the boots with it as well. 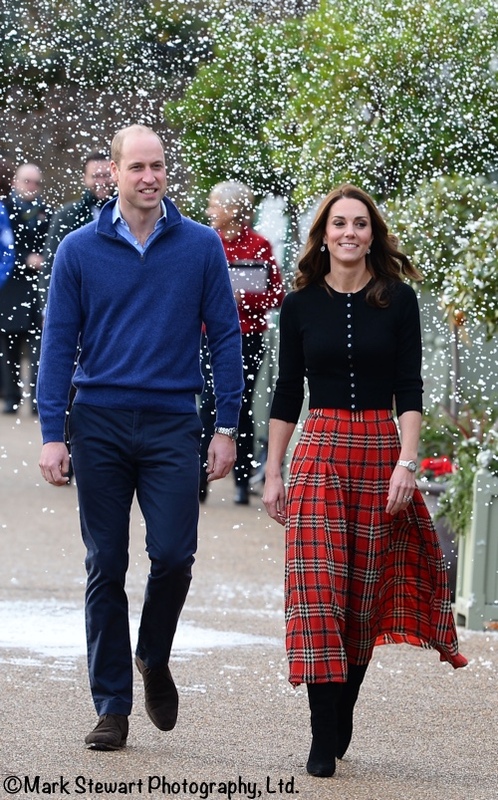 I kind of hope she repeats this skirt for the Christmas walk (depending on whether she and William go to her parents or Sandringham this yar). It’s so fun and deserves at least a few rewears during the holidays! I love this on her! She looks polished, yet so relaxed in what she’s wearing. Being Scottish, I am a big fan of royals wearing tartan! Kate looks lovely. Love the 3/4 cardigan. And it fits her perfectly. Love the plain style with no frills and busy details. The skirt is lovely and the red for a christmas theme matches well. I love the longer skirts. Copying for church this weekend! I think that a great idea for a December post would be a collage of all of the times that she has worn plaid/tartan. I know that there is another time when she has worn a long skirt like this, but can’t remember . . .
Can we vote on our favorite tartans as part of this post? Pretty please? Definitely the latter: considering the application/execution of the tartan within her wardrobe. While I have certainly critiqued the proportion of her outfits prior to this one, I don’t understand the proportion complaints today. If the sweater were longer or bulkier, I think the whole thing would look bulky and “schlumpy” as opposed to the sleek lines we see here. In fact, as much as I hate all midi length skirts, I find that pairing it with the tall boots actually looks great and also contributes to the sleek lines. I agree with another poster who said that short booties would have looked awkward with this particular skirt. 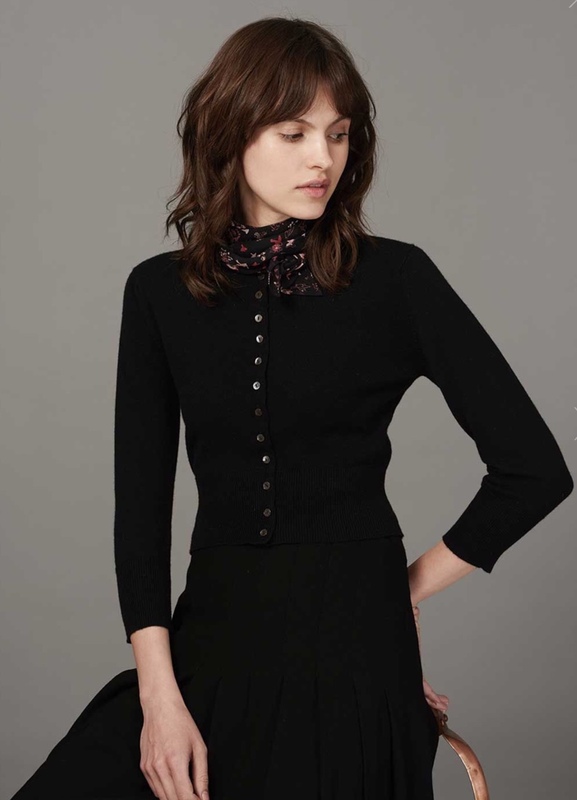 I love the cropped length of the cardigan with the higher waisted skirt, and I think that the way the skirt was styled for the catalog/product shoots was hideous. All in all, I thought this was a gorgeous look. It was dressy enough to show the proper level of respect for the deployed servicemen and women and their families, but also approachable enough for the children in attendance. The cheery red plaid was holiday appropriate without looking costumey. Hair and makeup and earrings and brilliant smile—all spot on. whoops—meant to add that I really want those boots and I hope we get an id on them. Wonderful engagement for the families of those serving. I would love if they made this an annual event. Kate’s outfit was perfect today. I love how she always breaks out the festive tartan at Christmas. @admin: LOL! I realised your snow comment was a little joke! I feel bad you have to keep explaining. Kate has being dressing beautifully lately. I wonder if she has someone different advising her or if she is making more time to work out her own looks. This is another super outfit and well accessorised. I love this skirt; the material and length are perfect for the occasion (cheerful and for kneeling down to small children). It would have looked dreadful with stilettos but with these boots, looks slightly edgy. Likewise the proportions of the cardigan show the waist whereas a slightly longer cardigan would have skimmed over and looked (the infamous) matronly. I’m a big fan of shrunken cardigans which clinch all sorts of things in and give some shape. Wow! This is so great. Kate looks amazing! And coincidentally its very similar to a kilt I have that I was planning in wearing to a holiday event at work this week. Except I’m in Canada so my tartan is a Bonda Maple Leaf tartan, but the cut and style of the skirt is near identical. I was planning on wearing a black turtleneck too. Well Im chuffed now to know my style is on point with the DoC! I was so surprised when I saw this! It’s nothing like Kate usually wears to events but it is so perfect for her, like it suits her personality and would be something she would chose to wear for herself in her everyday life but still looks fabulous. It really shows off that tiny waist of hers too! She looks stunning and the proportions are perfect. The cropped cardigan highlights her slim waist and allows the skirt’s shape and flow to shine. The high boots with the midi length skirt is classic and sleek. Booties would look silly, exposing an awkward piece of leg and cutting off the flow of the outfit. I confess to some confusion regarding comments about the proportion of this outfit and other outfits, too. I don’t see these proportion problems. I see a tall, slim woman with a figure made for wearing beautiful clothes, whether formal, professional, casual or laid back. Between her long legs and long waist, she’s a designer’s dream. I mean no disrespect to fellow posters, but sometimes the remarks about her waist and proportion seem nitpicky and irrelevant. I hope she wears more outfits like this one. It’s a nice change and a great look for her. 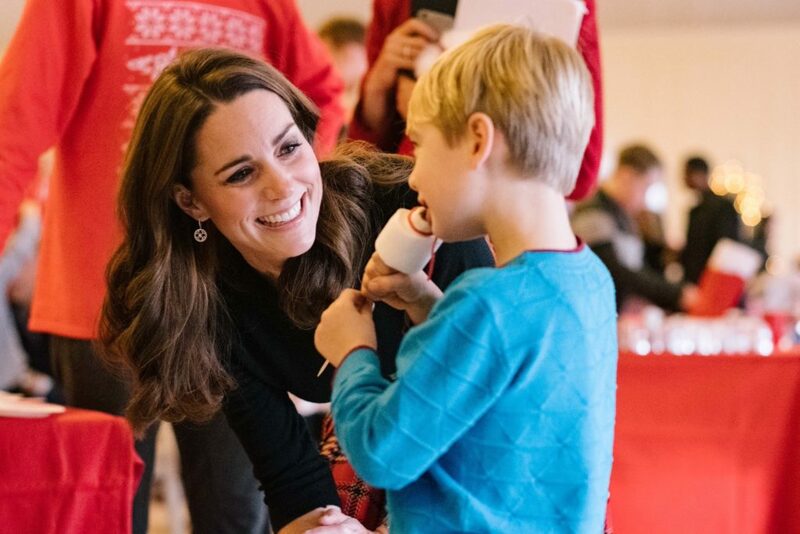 It’s such a treat to see a cheery festive Kate brightening up a dark December day. The Wickstead skirt is wonderful and the way Kate moves showcases its terrific swing. I’m just a smidgeon sorry we don’t get to see the belt detail as it’s covered by her top, but it all goes very well indeed with those snazzy new boots. 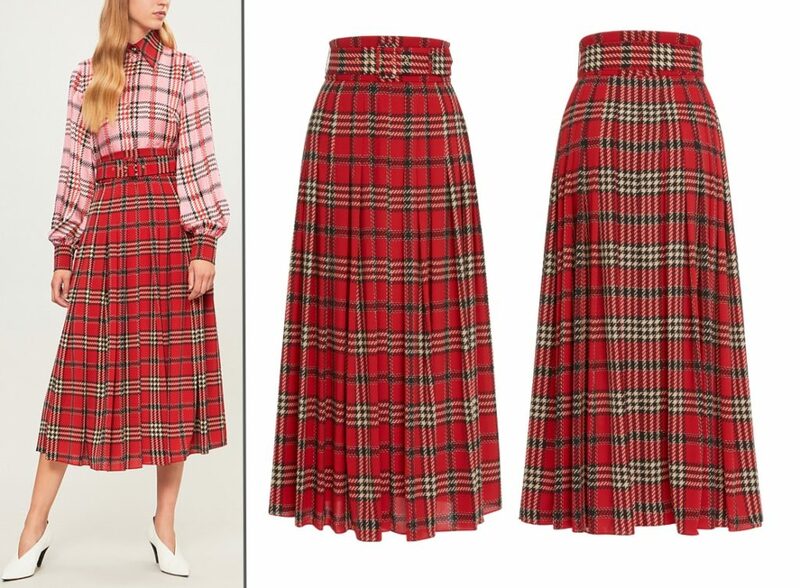 I found I had to do a double take at first as it’s so common for winter tartan skirts to be mini-length, but this midi style is lovely on the lean frame of our Duchess. I’ve often looked at those crop cashmere tops in Brora and wondered at how they can support such a hefty price tag for such a very small scrap of cashmere. Perhaps as I live in chillier climes I feel the need for a more generous expanse of cosy wool and suspect I could get it at reasonable quality for that money. But it is a very pretty style and nicely worked here as a neat black top, almost in the manner of a Highland dance outfit. I’ve put my order in for the latest WKW calendar with immediate effect, no sense in hanging around and ending up back of a long queue for the reprint. I was interested to see the Harry and Meghan notelets are still for sale and would like to add how much I’ve enjoyed having a set of them. The prints are excellent and the matching envelopes are in nice quality paper. The overall standard is so good they’re acceptable to use even for non-royal buddies. You said “Highland dance outfit”, and I heard “Brigadoon”. And now I can’t unsee it. This shall be forever enshrined for me as the “Brigadoon” skirt. I’m not convinced she’s wearing the belt. 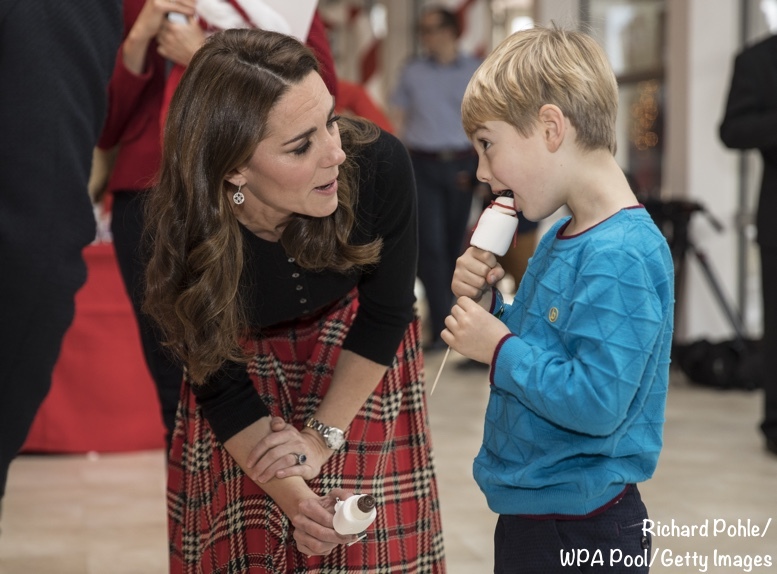 The photo of Kate, indoors, where she’s raising her arm to catch/throw a faux snowball leads me to believe she wasn’t wearing the belt which caused the waistband to droop (see full length photos). I really love this outfit. Everything about it works well for the event. It’s dressy while still making her look very approachable, a major plus around children. Being 5’4″ I’m not a fan of midi skirts but she’s tall enough to pull them off very well. Overall it’s just a great festive outfit. The personal nature of her remarks were also touching. Thankfully, I’ve always been with my family around the holidays but my heart goes out to the families separated due to military deployments. Very nice event. While not new, it’s always lovely to see her wearing items made in the UK. I’ve been looking for a nice cashmere sweater, so I looked at Brora’s website. The company’s emphasis on local manufacturing/hand weaving is very impressive. Focusing on the events makes sense, but I’m also happy to see small UK companies receiving attention. Meant to add that I would have loved to see a pink sweater with this instead of the traditional choice of black. This was a wonderful event for the Duke and Duchess to attend. They both look so genuine. I like the cardigan and hair but the rest of the outfit is a miss, especially the boots. Maybe I will like them if they are worn with a shorter skirt. Kate looks fabulous in that last photo with her beautiful smile. I see the comments that the proportions look off. I’m wondering if that perception doesn’t have something to do with the fact that we might be assuming the skirt to be a midweight to heavier wool. At least that’s what I thought at first. A kilt effect. But look how the skirt billows and ripples in the video. It must be very lightweight–even a rayon blend of some kind or very lightweight wool?–and so the little black cardigan is okay. Just a thought. 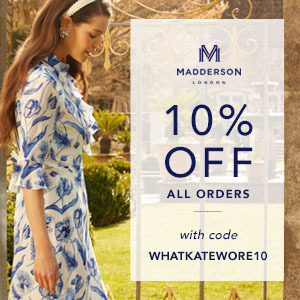 I looked at the collection on the Emilia Wickstead site but it doesn’t tell you what the fabric is. At least I couldn’t find it. Either way, I love this look with the boots and all. Kate looks great. That sounds as if it helps explain the fluid way the fabric moves when Kate is walking. I just saw! Lighter weight than I was thinking too–polyester! I have to rethink the whole look. It was more as if she was wearing a dress with a “sweater” top. I had thought it was a wool, kilt look with a sweater. So it was completely different than my first impression. Thanks for the extra info! I think she looks lovely and very festive. The proportions look perfect for her tall, slim build. And this is one look where hair down and flowing is just right. Red tartan will always say “Christmas” to me, especially when it’s worn so well! In the last video posted where they appear to be leaving, you get a bit of a side view of the boots and from that, I’m wondering if they are her Aquatalia Rhumba’s or a new pair. Although I can barely see the heel it looks as if it could be the same. Checked out the new picture, definitely not the Rhumbas, much narrower heel. Looks like a shoe mystery to solve! They remind me of the boots she wore the day if her 25th Birthday. Although that is just a quick look and not in detail. They do look very similar! The zippers on those ones are on the back though, I think, and these ones zip up the inside. Obviously a classic style she’s been rocking for years though. I think that this skirt would have been better showcased with the tighter black turtleneck sweater and tighter black boots, but I actually feel like this works. I rarely think Kate really masters separates, so that’s rare for me. She looks great, and those were lovely personal comments. First of all, this is such a wonderful gesture to plan a party for families, who will be away from their loved ones, who are serving their county, at Christmas. Kate’s speech and her attention to the children were so genuine. She is doing such a fine job and in spite of all the rumours swirling around about the Royal Family, Kate doesn’t seem to be focussing on anything other than making this event a stellar one. I, very much like her look today. 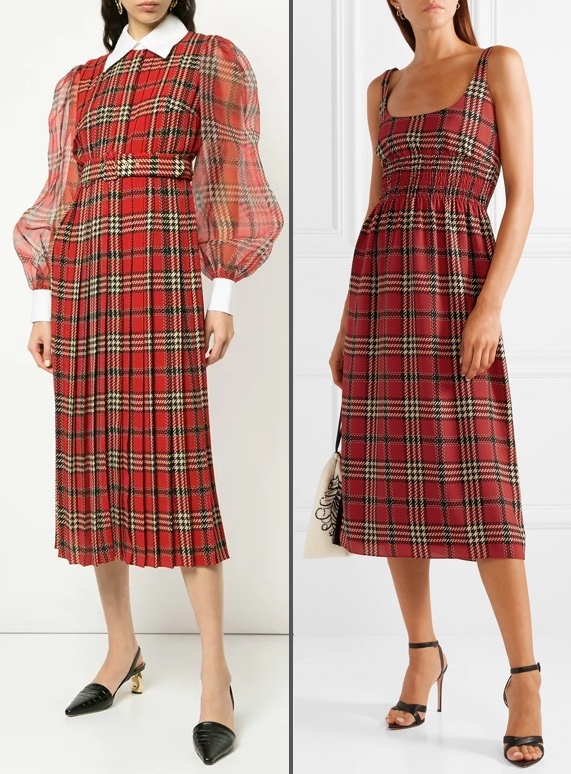 The red, plaid skirt is very festive and the length is elegant. The boots enhance the look. The sweater is a nice choice in solid black. I would prefer it to be a bit longer, at least to cover the waistband, also with longer sleeves. But those are small quibbles to an otherwise very cheerful and appropriate look. I wish William had worn a red sweater to complete the holiday theme. I wish George and Charlotte could have been there, but perhaps that would raise criticism as to why they weren’t at school. I also wish that I had the money and the property to have an Orangery at my house. I love the proportion of the sweater with the longish skirt. The skirt has a belt, which kind of peeks out from underneath the sweater. A longer sweater, or one tucked in, would have destroyed the contemporary vibe she has going here – with the most traditional combo on the planet. Well done, Kate! I enlarged the photo many times, Dale, and I don’t think Kate is wearing the belt. Agree with you about the longer skirt looking fine with the skimpy top. I was so pleased we got to see something new at last, after a run of repeats. Not a fan of the sweater. It looks like it shrank. I love it! Festive and still cool. I have no problems with the balance of the skirt and sweater. I think a longer or flowier top would have made the look too frumpy; the crop gives a nicely defined waist. Personally, I think it’s the boots that throw off the proportions. I would gravitate to short boots with a long skirt. But I don’t think it ruins the look, just a preference. I think Kate looks amazing and perfectly dressed for the occasion – cheerful, festive, gorgeous, just perfect. That bright skirt paired with a black cardigan so it’s not too overwhelming, the minimal jewelry, those lovely new boots, the great hair (thankfully not a pony) – all perfect! I know this is WKW and not WWW, but I was disappointed by William’s clothes. I didn’t expect to see him in a three piece suit, but I did think he would look a bit…umm… preppier (for lack of a better adjective). He was wearing the same clothes as at the Coach Core appearance. I found it too casual (sloppy is what I really mean but I don’t want to be too rude…) then and I find it even more casual today. I was wondering, at such occasions do all the children of these regiments’ soldiers serving abroad get to come to this party or is only a selected group that’s invited? I agree. It looks like they are dressed for different events. I mean, William looks perfectly fine and definitely like a “dad,” but his ensemble seems too casual for what she’s wearing. She looks like she’s going to a company Christmas party and he looks like he’s off to Tesco. Like a regular sweater would have worked, but something about the zip up sweater is just too casual. Such a happy Christmas look! The proportions look slightly off to me – the cardigan too short, too tight? But overall a fantastic day/party look! I tend to agree. I think it’s the length of the sweater compared to the sleeve length. A long sleeve, or maybe if she had the cardigan tucked in to raise her waistline. I love the look overall, very Christmas-y, but I agree, something is not quite right. I agree a tuck-in on the cardigan may have helped present a cleaner edge at the waistline, but I do prefer the 3/4 sleeve vs full sleeve. While we all wish duchesses to be above such things, it’s probably a more practical choice given the interactive nature of the event. Love this look! The cardigan, skirt, and boots are perfect for a children’s party. As a side note, the Orangery serves a fabulous, albeit expensive, afternoon tea. We indulged a few years back and it was worth every penny. I am not sure if the fashion display is still on at KP, but that is also another great stop to combine with the tea if you are visiting London. I went to the Orangery for tea too! Ages ago (2006 I think). For a Royal Fan it was epic. And there was a Diana fashion exhibit at KP that we saw so it was an extra special visit for me. A great choice today the Duchess looks terrific. Love the tartan skirt, she looks amazing. Ugh- the proportion is so off. I like g sleeve sweater with some weight would balance the skirt and boots. The tiny fitted sweater w slouch-y boots and long pleated skirt looks so wrong. What family tartan is that? Anyone know? I have had just a little time to look but haven’t been able to find any information. My guess is that it is one designed just for this line. Wonderful! A short or medium-length jacket or coat, taken off inside, would complete the look. I love this outfit! The way the bottom of the skirt sways when she walks in the videos is also fantastic. Happy Christmas! I’m not the biggest fan of the skirt but this is the perfect occasion for it so it definitely suits! Love this! So fun and festive. She looks just radiant. Also, I wish all cardigans had such closely placed buttons so that one could wear them buttoned like this! Nothing like red plaid at Christmas! Beautiful skirt by Emilia Wickstead but not loving the cropped cardigan with this skirt. The short cardigan exposes the skirt’s waistband which in this case seems to be sagging – perhaps from elastic or backing in the waistband – or absence of the belt seen on the model? The styling with the pink plaid blouse with red plaid collar and cuffs (model photo seen above) is so elegant and stylishly fashionable. I agree a belt would have made it amazing! I love the plaid for this function, I would have preferred a plain black sweater without buttons. I’ve never worn my cardigans fully buttoned closed or with out a shirt underneath so that part is awkward for me. Kate smile tells so much more of the story and her interactions with William are so lovely to see. Absolutely love this one! It’s so festive and chic, and Kate pulls it off beautifully. I like the boots and I hope we’ll see a repeat of them soon, but I do wonder if black suede pumps or booties wouldn’t have fixed some of the proportion issues here. It feels like I’ve been seeing the midi skirt/slouchy boot combo a lot, and I think it comes off as just a bit bulky. The light sweater with 3/4 sleeves that Kate is wearing here exacerbates that bulkiness a bit and makes the outfit appear a bit unbalanced. 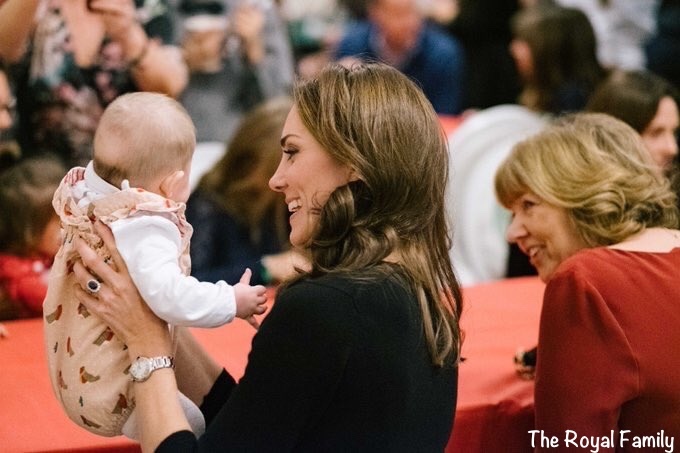 That aside, still one of my favorite things we’ve seen Kate in since her maternity leave. Love this! Finally, an age appropriate look. 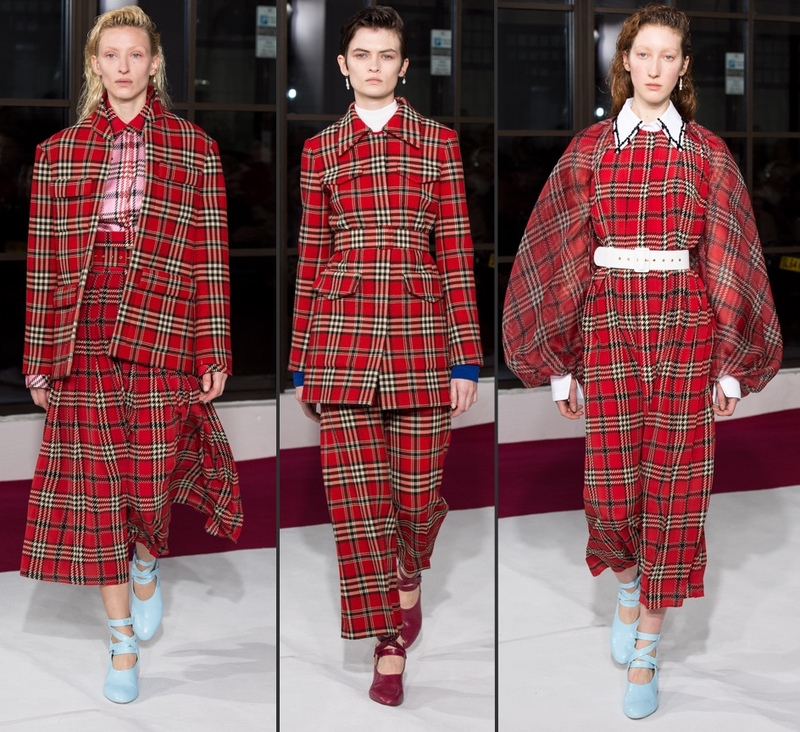 And I like this plaid a lot…festive but not as overly “on the nose” as last year’s red and green plaid coat. This is the kind of look I would love to see from her more often. Susan, thanks for making me smile first thing today. Kate looks both awesome and very happy rolled into one. I love the picture of her looking at William from the podium. They may not always be too openly affectionate, but this picture shows that they are as in love as ever. I was thinking all the same things. I thought she looked fabulous; I loved the outfit and how it fit her. William was beaming at while she made her speech and she at him. Their connection and chemistry is palpable right though the pictures; no PDA necessary. I just love that about them. i’m not fond of this outfit on kate. i think that the proportions of the pieces are off. the short sweater and then long skirt make her look short waisted. perhaps a longer sweater or a blouse with a belt would look better. I think a blouse might work quite well with the skirt if Kate brings it out again, but I wouldn’t have thought a longer sweater or cardigan would be a good idea, it would give too much bulk. A long cardigan with long skirt can look quite droopy and drab. I really love the skirt and top. I’m glad she didn’t wear it as styled by Wickstead. All that plaid is too much. The skirt and black cropped sweater is just enough. Kate looks very relaxed and happy. I love this outfit, Mark Stewart’s picture with the snowflakes in the background is magical. The heavy photoshopping on this photo really stands out as being edited. There is no way it is snowing that heavily behind them and there isn’t a single snow flake showing up on her black sweater or his blue sweater. 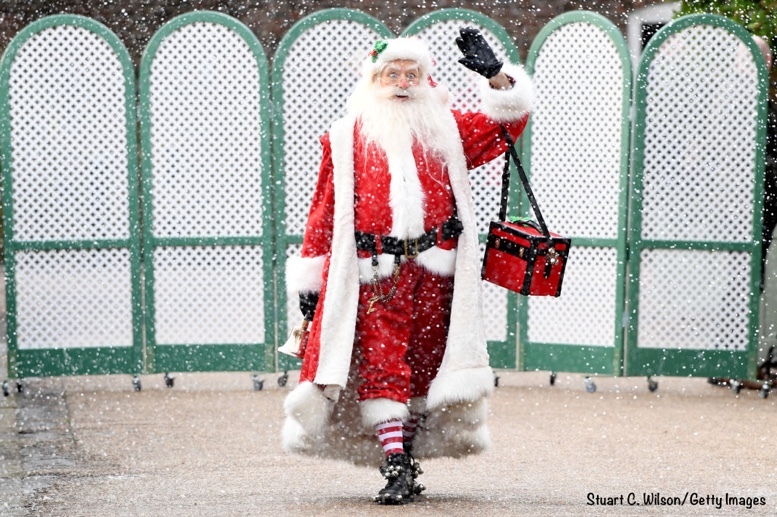 Compare it to the photo of Santa where he is covered in snow and you will see what I mean. A snow machine was switched on after they passed to give the heavy sniw effect – they didnt walk through it anf therefore didnt gave any on their clothes. I love this outfit- because it’s different than what we usually see on the duchess! The skirt is fab, the cardigan goes well with it, and I love the boots. Normally not a fan of skirts or dresses hanging over boots, but I think it works here! I agree! I like this outfit – it’s different, not just another coat dress. I love, love, love this. Wish I could pull off cropped tops! I love this outfit. So festive. Really fun….now I know what to wear with a long plaid skirt! She looks great!!!!! Oooo…this reminds me of the long kilt I used to wear to parties (including college dances in the ’70s). Of course I didn’t look as gorgeous as KM, who does? Anyway, I am glad she wore the skirt with a solid black top and not the way the designer showed the plaid it in the photos accompanying the article. I think the sleeves are 3/4 and not just pushed up, in any case, the shorter sleeve and the tall boots are balanced and look great with the skirt. Also, the minimalist accessories look so youthful, just earrings and watch and KM is good to go! Her slight side part and lighter color hair is wonderful. It must be warm in London today, no coats for the Cambridges! Amy – I had a Charlotte Ford pleated long plaid skirt that I wore in college in the late 1970’s. I loved that skirt, always received compliments. Mine was reversible, but I always wore the darker side of the navy and green. Everything old is new again, although I prefer to think I was ahead of the times! JKC – Mine was jewel toned and my mother bought it for me after YSL came out with his Russian look, although the kilt definitely looked Scottish. I doubt it was an authentic tartan. Anyway, I went to one dance at college wearing the kilt, a shetland sweater and topsiders. Can’t get more preppy than that. Don’t think I will repeat that look anytime soon. Thanks for the memories! Don’t forget the shetland sweater and topsiders. To be honest, I think I would like this better in a long sleeve because something about the proportion looks off to me. That said, I think this is a fun, festive look for a Christmas party! I love this! Especially the slouchy boots vs the fitted top. Oh wow, I love this! What a perfect Christmas party look. The contrast of the bright tartan and the soft black cashmere and suede is a delight. The empress earrings are just the right touch of holiday sparkle. I’m so glad midi skirts are coming back. They are so easy to wear and I think they can look so elegant. I love this too! I think she looks great…. and Christmas-y 🎄 Fantastic shots of them walking through the faux snow. I know she’s not a brooch kind of girl but this would have really shown off something with rubies, or given emeralds a chance to shine for a Christmas vibe. I hadn’t even considered this, but you’re right- a red brooch would have been beautiful with this outfit! What a great suggestion! They’re not something we expect to see from her often, as you noted, but here one would have contrasted nicely against the dark sweater. While the skirt certainly brings enough “festive” in this outfit for the event, a brooch would have been a fun sparkly addition. I also am enamored with this lovely, lovely skirt and cropped top! Sara – had she had you for her stylist, the addition of a beautiful brooch, in reds and greens, would have catapulted this outfit to the top 3 of all her Christmas ensembles. I have a friend, who wears her grandmother’s brooch at Christmas time. It is a beautiful cluster of holly. The leaves are sterling silver and the red berries are small rubies (not sure if the rubies are real.) It is so pretty and perhaps next year Kate could borrow it, although we all know she is not, as you say, Sara, a brooch kind of girl. She looks gorgeous! Absolutely love everything. Is she wearing her usual watch? It looks a tad lighter.